Rep. of the VC, the DVC (D), Prof. Felix Salako (Centre) with participants at the Joint Research Proposal meeting on cross-breeding of Kalahari Red Goats. The Federal University of Agriculture Abeokuta (FUNAAB) is set to start the cross-breeding of the Kalahari Red Goats with the Red Sokoto and West African Dwarf goats. This is for the purpose of improving meat and milk production as well as to increase the foundation stock of the Kalahari Red Goats from 57 to 500, within the next three years. This fact was made known at a Joint Research Proposal meeting, held last Wednesday, between the Federal University of Agriculture, Abeokuta (FUNAAB) and the National Animal Production Research Institute (NAPRI). At the occasion, the Vice-Chancellor, Professor Olusola Bandele Oyewole, disclosed that the involvement of FUNAAB in the Kalahari Project was part of the fall-out of the visit of the immediate past Vice-Chancellor, Professor Oluwafemi Balogun, who was on the entourage of the Executive Secretary, National Universities Commission (NUC), Professor Julius Okojie to South Africa, in 2011. 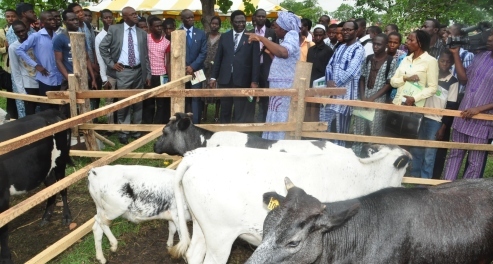 Represented by the Deputy Vice-Chancellor (Development), Prof. Felix Salako, the Vice-Chancellor stated that interest in goat farming all over the world had risen and according to him, “high demand for goat meat and milk products as well as the relative low cost of production had led to increased goat production in the southern USA”. He added that as a good source of income generation, same can be replicated in Nigeria. The Director, Institute for Food Security, Environmental Resources and Agricultural Research (IFSERAR), Professor Segun Osinowo, declared that the imported Kalahari Red Goats cost the University almost 75 million Naira. He commended the efforts of the immediate past Vice-Chancellor, Professor Oluwafemi Olaiya Balogun, as the chief-promoter of the project, pleading that the current Management should sustain the initiative. “This is a project of national importance and deserves greater support”, he noted. In his goodwill message, the Deputy Director, National Animal Production Research Institute (NAPRI), Prof. Clarence Lakpini, acknowledged that the goats were doing fine since they were brought into the University. The Kalahari Red Goats originated from the Kalahari Desert in South Africa and their introduction into Nigeria was pioneered by FUNAAB.